Wisconsin courts and lawmakers could immediately lessen the disparate impact and high costs of the state's incarceration laws by addressing prison sentences for certain inmates who committed crimes when they were under age 18. The Supreme Court’s recognition that children (that is, individuals under age 18 at the time of the crime) are different has led many states to revisit the sentencing of children in adult criminal courts. Indeed, 21 states and the District of Columbia have banned sentences of life without the possibility of parole for children,4 three state supreme courts have held that their state constitutions prohibit life-without-parole sentences for children,5 and resentencing proceedings continue throughout the country. So far, Wisconsin has not followed suit. 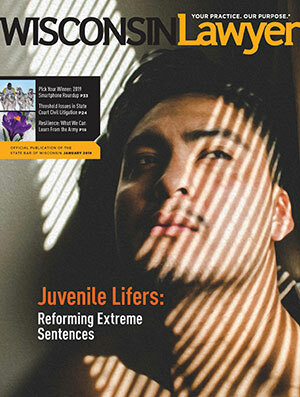 This article offers data about those individuals who are serving life-without-parole sentences for homicides committed when they were under 18 years old, summarizes the major relevant Supreme Court decisions, and offers thoughts for reform.6 Such reform would align Wisconsin with the Supreme Court’s decisions and would constitute a step toward reducing mass and disparate incarceration in Wisconsin. edu eileen.hirsch wisc Eileen Hirsch, Virginia 1977, began a Juvenile Life Without Parole Project in the U.W. Law School’s Frank J. Remington Center in 2016. The project’s goal is to bring Wisconsin law into alignment with the U.S. Supreme Court’s decisions about sentencing of juveniles in criminal court. edu martha.askins wisc Martha Askins, U.W. 1985, is a former assistant state public defender, appellate division, and now is a clinical instructor at the U.W. Law School’s Frank J. Remington Center. While the number of these prisoners is small, the number of years they will serve in prison is huge. If they live on average 50 years after initial incarceration, the state will spend more than $1.9 million each for costs of imprisonment, assuming the current cost per prisoner remains constant.9 Together, these 33 men will have served at least 550 years in prison, at a cost of almost $64 million. Most of these 33 men suffered significant trauma as children – being victims of physical or sexual abuse or neglect; witnessing domestic violence; having parents or older siblings who abuse substances, have mental illness, or are engaged in crime; or some combination. The predictions during the mid-1990s that thousands of juvenile “superpredators” would soon appear and threaten public safety did not materialize. The proponents of these predictions later disavowed their theory, noting that juvenile crime had instead decreased, and that recent scientific evidence and empirical data invalidated the juvenile superpredator myth.18 At about the same time the superpredator myth was fading, neuroscientists discovered through brain-imaging technology that the parts of the human brain involved in decision-making were not fully developed until after age 18. U.S. Supreme Court decisions regarding life-without-parole sentences imposed on juvenile offenders are based on the basic principle that children who commit even the most heinous crimes are capable of change. They are different from adults. They are redeemable. Below is Alphonso James’s description of his arrival in prison as a juvenile. Alphonso James was arrested for murder in 1985 when he was 17 and has been alleging his innocence ever since. Nevertheless, he was tried, convicted, and sentenced to life in prison. Unlike the juvenile offenders described in this article who have life-without-parole sentences, James was made eligible for parole and was released from prison in February 2017. He served 31 years in prison. He now lives in Milwaukee, where he works as a chef. He often speaks publicly about his experiences. “The scariest thing ever. You see stuff like that on TV and you hear the horror stories. I’m a kid the first time in prison and I was hearing a whole lot of horror stories and when I went there the first thing – it’s the scent, it’s the screaming, it’s the music blaring, it’s the guards, it’s the fights, it’s all those type of things. “They put me in a cell by myself, no TV. I had a mattress that had holes, there is urine all over it. They gave me a sheet that went over half the bed. It was like one of those things – I don’t want to die here. I felt as though somebody put me in a coffin and was trying to close the door and I had my hands sticking out. I said, ‘no, I’m not going to let you close the door on me.’ So I always lived my life as if tomorrow I was going home. I never accepted the fact that I was convicted of a murder and given a life sentence. I never accepted that. Never. Even when I went to the parole board those 24 times, I’d always tell them, you’ll never get me. I’ll die in prison before I lie. The next two cases to reach the Supreme Court challenged the constitutionality of life-without-parole sentences for children under age 18. In the first, Graham v. Florida,23 decided in 2010, the Court held that a life-without-parole sentence is cruel and unusual punishment for children who have not committed a homicide. In the second, Miller v. Alabama,24 decided in 2012, the Court held that mandatory life-without-parole sentences, even for homicide, are cruel and unusual sentences for children. At about the same time the superpredator myth was fading, neuroscientists discovered through brain-imaging technology that the parts of the human brain involved in decision-making were not fully developed until after age 18. Do Miller and Montgomery govern discretionary imposition of life-without-parole sentences on children? Do the Graham and Miller decisions apply to “de facto” life-without-parole sentences, for example sentences delaying release eligibility for 50-100 years or more? What substantive and procedural requirements apply to sentencing hearings of child offenders? The Wisconsin Supreme Court’s only decision on the constitutionality of a life-without-parole sentence was in 2011, in State v. Ninham.35 In that case, decided after Graham v. Florida, but before Miller v. Alabama and Montgomery v. Louisiana, the Wisconsin Supreme Court held that Omer Ninham’s life-without-parole sentence was not unconstitutionally cruel and unusual because Graham did not apply to homicide offenders. Two major avenues for reforming sentencing of children are available in Wisconsin. First, the supreme court could accept review of one or more pending appellate cases challenging existing life-without-parole sentences and address the three issues set forth by the court of appeals in its certification decision. If the supreme court determined that the principles and requirements of Miller and Montgomery apply to discretionary sentencing and that a 77-year delay in parole eligibility is a “de facto” life sentence, it could provide guidance to courts throughout Wisconsin about the sentencing of juveniles post-Miller and Montgomery. The state legislature could enact legislation that would prohibit life-without-parole sentences for children, establish sentencing considerations that meet the standards of Graham, Miller, and Montgomery, and create a sentence review hearing for child offenders to give them a meaningful opportunity for release. Four decisions by the U.S. Supreme Court – Roper,Graham, Miller, and Montgomery – have fundamentally altered the sentencing of juveniles convicted of serious crimes in adult court. The Court recognized that children are constitutionally different from adults and said that states must give a juvenile offender some meaningful opportunity for release based on demonstrated maturity and rehabilitation. It remains to be seen how Wisconsin’s courts and the Wisconsin Legislature respond to these decisions for juveniles now serving life sentences and in future cases. Who has most inspired you in your legal career? I’ve been lucky enough to work for and with some inspirational people at different points in my legal career. I had the good fortune to intern for Justice Shirley Abrahamson when I was a student. Her work ethic and commitment to the law were inspirational, particularly to a law student. My first job out of law school was as a clerk to federal District Court Judge James E. Doyle. His respect for everyone in his chambers and his court, his quiet and calm demeanor, and his wit and impressive intellect influenced me tremendously. I was a public defender for many years in the Madison office of the State Public Defender’s Appellate Division. My colleagues inspired me with their talent, creativity, support of each other, perseverance, and work ethic. Their dedication to excellence in criminal defense, day in and day out, was inspiring. Now that I work with students, I find they inspire me. They will make the world a better place. edu martha.askins wisc Martha Askins, U.W. Law School, Madison. 1 Amicus Brief of the American Medical Association, American Psychiatric Association, et al. in Roper v. Simmons, 543 U.S. 551 (2005), page 2. 2 Miller v. Alabama, 567 U.S. 460, 471 (2012). 3 Montgomery v. Louisiana, 136 S. Ct. 718, 735 (2016). 4 See Josh Rovner, “Juvenile Life Without Parole: An Overview,” Oct. 22, 2018. 5 Diatchenko v. District Attorney, 1 N.E.3d 270 (Mass. 2013); State v. Sweet, 879 N.W.2d 811 (Iowa 2016); State v. Bassett, 428 P.3d 343 (Wash. 2018). 6 A note on terminology: The term used nationally to describe life sentences in which the individual will not be eligible for release from prison during his or her lifetime is “life without parole,” abbreviated to LWOP. In Wisconsin, most individuals described in this article are serving sentences pre-dating Dec. 31, 1999, when the first phase of truth-in-sentencing became effective. Under truth-in-sentencing, what was previously called parole is now called “extended supervision.” In this article, when the term life without parole is used, it should be interpreted to include eligibility for both parole and extended supervision. 7 Data provided to the Remington Center, U.W. Law School, by the Wisconsin Department of Corrections (DOC), describing inmate populations as of Aug. 31, 2018. 8 DOC data as of Aug. 31, 2018. Where that data is incomplete regarding release eligibility dates, Remington Center staff obtained release eligibility dates from CCAP, Wisconsin Court of Appeals decisions, clerks of court, and prison registrars. 9 The state spent $38,644 per inmate per year in 2015. 10 DOC data as of Aug. 31, 2018. 11 The Sentencing Project, “The lives of juvenile lifers: Findings from a national survey” (2012). 12 Miller, 567 U.S. at 476 (quoting Eddings v. Oklahoma, 455 U.S. 104, 115 (1982)). 13 Amicus brief, supra note 1, at 20-21. 15 John J. Dilulio Jr., The Coming of the Super Predators, The Weekly Standard, Nov. 27, 2995 at 23, cited in State v. Null, 836 N.W.2d 41 (Iowa 2013). 16 James Alan Fox, cited in Null, 836 N.W.2d at 53. 17 Null, 836 N.W.2d at 53-54. 19 Roper, 543 U.S. 551. 20 Amicus brief, supra note 1, at 2-3. 21 Roper, 543 U.S. at 569-70. 23 Graham v. Florida, 560 U.S. 48 (2010). 24 Miller, 567 U.S. 460. 25 Graham, 560 U.S. at 71-74. 26 Montgomery, 136 S. Ct. 718. 27 Id. at 734 (internal citations omitted). 29 Landrum v. State, 192 So.3d 459 (Fla. 2016); Luna v. State, 387 P.3d 956 (2016); People v. Holman, 91 N.E.3d 849 (Ill. 2017); State v. Valencia, 386 P.3d 392 (Ariz. 2016); Steilman v. Michael, 407 P.3d 313 (Mont. 2017); Veal v. State, 784 S.E.2d 403 (Ga. 2016); Windom v. State, 398 P.3d 150 (Idaho 2017). 30 Jones v. Commonwealth, 795 S.E.2d 705 (Va. 2017). 31 See, e.g., Casiano v. Commissioner of Corrections, 115 A.3d 1031 (Conn. 2015); People v. Caballero, 282 P.3d 291 (Cal. 2012): People v. Reyes, 63 N.E.3d 884 (Ill. 2016); State v. Boston, 363 P.3d 453 (Nev. 2015); State v. Ragland, 836 N.W.2d 107 (Iowa 2013); Bear Cloud v. State, 334 P.3d 132 (Wyo. 2014). 32 Compare Bear Cloud v. State, 334 P.3d 132 (Wyo. 2014) with Ira v. Janecka, 419 P.3d 161 (N.M. 2018). 33 Compare State v. Zuber, 152 A.3d 197 (N.J. 2017) and State v. Moore, 76 N.E.3d 1127 (Ohio 2016) with Willibanks v. DOC, 522 S.W. 3d 238 (Mo. 2017) and State v. Ali, 895 N.W.2d 237 (Minn. 2017). 34 Compare Davis v. State, 415 P.3d 666 (Wyo. 2018) and Commonwealth v. Batts, 163 A.3d 410 (Pa. 2017) with State v. Ramos, 387 P. 3d 650 (Wash. 2017), and Garcia v. State, 903 N.W. 2d 503 (N.D. 2017). 35 State v. Ninham, 2011 WI 33, 333 Wis. 2d 335, 797 N.W.2d 451. 36 State v. Ninham, No. 2016AP2098 (Wis. June 11, 2018); State v. Walker, No. 2016AP1058 (Wis. June 11, 2018). 37 State v. Jackson, No. 2017AP712, 2018 WL 4179078 (Wis. Ct. App. Aug. 28, 2018) (unpublished). 38 State v. Barbeau, 2016 WI App 51, 370 Wis. 2d 736, 883 N.W.2d 520. 39 Montgomery, 136 S. Ct. at 736. 40 Data from the Juvenile Sentencing Project. 41 Montgomery, 136 S. Ct. at 736.